During our October 16th meeting, State Representative Tom Murt visited our club. The representative is running for re-election this fall in the 152nd district. The Lions thank Representative Murt for coming to meet the Lions and exchange ideas. The representative hopes his prior two years on the job will encourage voters to re-elect him. He's done many things over his short career as elected official, all of which he is very proud of. 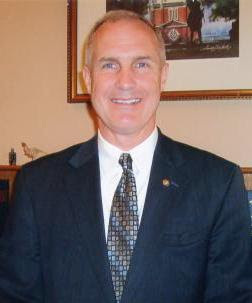 His office is the busiest state representative office in the Pennsylvania. He's fought for legislation to help families with Autistic and special-needs children, as well as legislation that helps adults with Autism, Tourettes, and other special needs. He's helped parents fight for funding and services from their local school districts. He's worked to get several historical markers placed around Hatboro, including bids to erect memorials for Vietnam and Korean War veterans. He's also started a "Visiting Santa" program, where the representative (dressed as Santa Claus!) comes to visit children who may not be able to get to the shopping malls in order to tell Santa their wish lists. Tom is a local guy, who knows the area very well. He's a teacher. He's also a member of the Army Reserve, and has served in Iraq with his reserve unit. We found him down-to-earth and easy to talk to, and genuinely eager to help his community. We thank him again for the visit. Lions White Cane Days are a yearly event aimed at meeting the community, sharing the purpose of the Lions, and raising funds for the blind. This year we were located outside the Wawa on Route 611 on Saturday, October 4th, from 11am through 3pm. We met many people from the community, handed out coloring books, pencils, and literature, and raised funds to help the blind in Montgomery County. Thanks go to Lions Tara Smith, John Bill, John Campisi, Joe Nemath, and Steve Girone for their efforts. Many thanks also go to Wawa Stores for permitting us to conduct this valuable fundraiser. 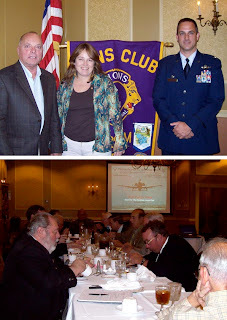 We were very pleased to welcome Col. Comtois to our club on October 2, 2008. Thanks to Lion Larry Glemser, also of the 111th Fighter Wing, Pa. Air National Guard, who extended the invitation. The Col. presented an informative slide show to our members, answered questions, and shared stories about the future of the Naval Air Station Joint Reserve Base. The Col. helped explain that while the base as we currently know it will be changing, and many of these changes have yet to be determined, we will still have an Air Reserve Station. 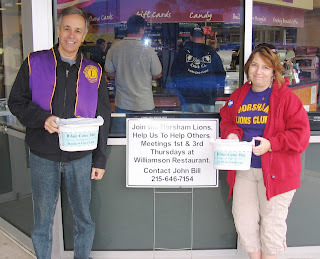 Also in attendance this night was our neighboring club, the Willow Grove Lion's Club. Upon hearing that the Col. would be available to answer questions at the meeting, President Will Smith of the Willow Grove Club, contact his members to invite them to join us for dinner. It's always nice to host visiting clubs, it was especially nice to see these members again. 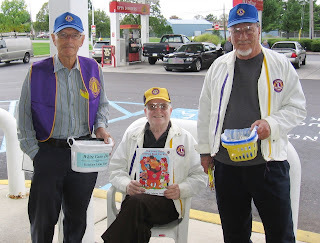 Willow Grove Lions Club will be starting a donation collection program, gathering items to be donated to soldiers overseas. Both Larry Glemser and Col. Comtois were able to help direct them on where to get specific questions about their upcoming service project answered. The Horsham Lions Club, as well as other local clubs, will be invited to join in this worthwhile service project. Thanks to Larry Glemser who initiated this presentation, and thanks also to the entire Willow Grove Club, and especially to Col. Comtois for being our guests.